It is with great sadness that we the family of Louise (Smith) Erskine, RN announce her peaceful passing following a lengthy illness in Northwood Manor (centre) , Halifax NS. Louise was the eldest daughter of Alexander and Geraldine Smith, Sydney NS. Louise was a loving mother to her three children, grandson, sister and dear friend to us all. 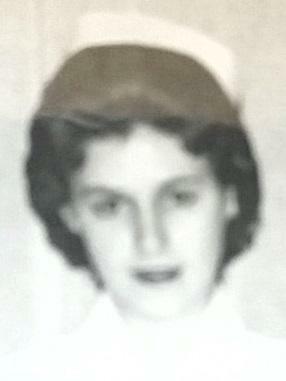 Louise proudly graduated as an RN from the school of nursing at the City Hospital Sydney NS in 1963 and worked there until moving to the Truro area and the Colchester Hospital. It was there that she met her future husband, Kenneth Warren Erskine, with whom she raised three children while continuing her nursing career at the Victoria General Hospital. While at her VG position, Louise worked ardently in areas of surgical, medical, neurology, coronary and cardiology care. She prided herself in being part of the team performing the first heart transplant in NS. Louise was a beautiful soul who loved to sparkle in her jewelry and hats. In her spare time, she watched old black and white movies, collected stained glass and loved to crochet. Vacations were mostly spent family camping and doing exploration travelling. She loved museums and history. Education never ended for her. During her time in Northwood, Louise befriended many and bonded with the nursing team as if to be a coworker. Together they travelled the road of Louise’s care together. Our thanks to her dear team at Northwood and her “special caregivers” that she bonded with during her 12 years there. Louise leaves to mourn her loss her three children, loving daughter, Patricia; sons, Stuart (Jing & their daughter Chenxi) and Wesley Erskine all of Halifax. Her special grandson, Ashton will be with her always! Also surviving are her sister, Alexis (Walter) MacDonald, Brothers, Allan(Linda), Paul (Juanita} Sydney NS and Gerald (Bev) Smith, Kitchener ON and many nieces and nephews. Predeceasing Louise were her dad and mom, Alex and Gerry Smith (Smiths' Bakery) and sister, Patricia Smith. Louise was also predeceased by her special aunt, Joyce Difabio. In keeping with Louise’s wishes she will be returning to her beloved Cape Breton home. There will be a special gathering and celebration in Louise’s memory at a later date to be announced, along the Bras d’or Lakes, which she loved. Please remember her for her winning smile and dedication to family and service. She has left her mark on many in this life as we are certain she will in heaven. Fly high dear angel! Tributes in Louise’s memory may be made to the Heart and Stroke Foundation or charity of one’s choice. Online condolences can be forwarded to the family through alexis.macdonald@ns.sympatico.ca.